Tired of Winter Already? Why Not visit Poipu Beach? Are you tired of the cold winter weather already? Yes, I know it is only the beginning of February, and it looks like it is going to be a long winter this year. Phil predicted that there is going to be another six weeks of winter. That gives plenty of time to think about going to some place warm for a winter vacation, some place like Poipu Beach, Kauai, recently named one of America’s Best Beaches by The Travel Channel. 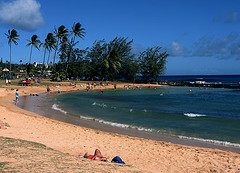 Poipu Beach is located on the southern end of Kauai, in the Hawaiian islands. PO’IPU is the most popular vacation spot in Kauai. PO’IPU means “completely overcast”, but, ironically, the location gets more sunshine than anywhere else on the island. PO’IPU is known for its scuba diving, snorkeling, windsurfing, and surfing, and is a great family vacation spot. When you make reservations to visit, you will need to fly into Lihue, the airport code is LIH. 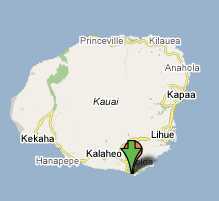 Lihue Airport has 872 acres and is located about 1.5 miles east of Lihue, on the southeast coast of the island. Probably the best Poipu vacation rentals are going to be the Poipu condos which are part of the Parrish Collection Kauai, formerly known as Grantham Resorts. Keep in mind that in the area there really is not any town to wander through or anything else to do in the area, so you’ll want to make sure that you stay at a great resort so you can just “hang out” like we did when we visited. In fact, you might consider the extra cost of renting an entire home, the Parrish Collecton has wonderful Poipu home rentals. In September of 1992, Hurricane Iniki left Po’ipu virtually in ruins. The roofs of many hotels were ripped off, and many of the rooms were full of sand. It took many years to bring things back to normal, and most of the properties have been completely rebuilt now. Poipu is a great golfing destination if you love to play golf. At the end of November every year, the Po’ipu Bay Resort golf course hosts the PGA Grand Slam tournament. Whatever you do, if you’re sick and tired of the cold winter weather, consider a vacation to Poipu Beach, where it’s warm and sunny most of the time.